Are you ready to view the wildlife of Colorado? 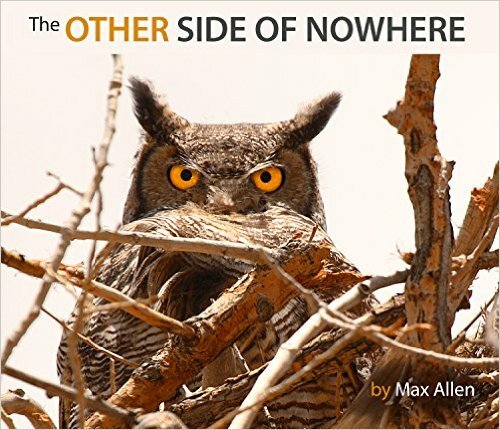 Check out The Other Side of Nowhere by Max Allen. The Other Side of Nowhere is a collection of wildlife photography from a remote area in northwestern Colorado centering along the Yampa River. The author spent several years in the area working as an itinerant biologist and photographer, and came to know the landscape and its wild inhabitants. It is a land of sagebrush and prairie, large swollen rivers and high sandstone cliffs. It is not a land of people. The Other Side of Nowhere is a photographic journey with the wildlife of this land that so few people know, from badgers and prairie dogs to sage grouse and golden eagles, along with many other species. The photographs are accompanied by a selection of stories behind how some of the photographs were taken, as well as natural history essays about the animals. This is a beautiful book with some wonderful photography. Some of the colorful photographs even appear to come to life with the animals almost alive. I used to live in Colorado, which gave this book immediate appeal to me, plus the fact that the photos are mostly animals. The author does a great job of catching the animals in action, whether it is running, fighting with another critter or in flight. He tells you how he caught the photo, what camera settings were used and the background of many of the photos. If you’re into photography or wildlife or know someone that does, I strongly recommend this book. It is truly a thing of beauty. You or the recipient of this book will return to it time after time to admire the animal photos inside. Disclaimer: I received a e-Book copy from Story Cartel in exchange for a fair and honest review. Max Allen (1977- ) is a carnivore biologist, author, and photographer. Max was born in central Vermont, and has lived throughout the American west and New Zealand. He was awarded his PhD in Conservation Biology from Victoria University of Wellington in 2014, for his dissertation entitled The Ecology and Behaviour of Pumas (Puma concolor) in Northern California. Max is an award-winning photographer (max-allen.artistwebsites.com), and published his first book - The Itinerant Photographer - in 2010. He has worked for a diverse group of government agencies and non-profit corporations in his diverse career as a park ranger, teacher, and wildlife biologist. Max is currently a research biologist with the Santa Cruz Puma Project (santacruzpumas.org) in central California. Until next review, stay safe. Smile! Show compassion to others. Be nice to one another. Read a book and pass it on. Review it. Cheers! In Shattered Lies: "It's All About Family." Available now from Black Opal Books and for sale at on-line retailers and indie booksellers. "Some secrets should remain that way." And now for some legal stuff: Copyright 2015 by S.J. Francis. Opinions expressed here are solely those of the author, S. J. Francis and are meant to entertain, inform and enlighten, and intend to offend no one. Have U read the Ballad of Black Tom, yet? You should. You really should. I gave it 5 stars for this powerful emotional read.